The chef wasn’t even making frittatas, he was actually making egg white omelets. Kind of like that fine Corinthian leather Ricardo Montalban spoke about, but does not actually exist. So what exactly is a Frittata then, other than a way to clean out the fridge, use food in your fridge that will spoil soon, or pair up the 1 sausage link, with the one slice of bacon and the small chunk of ham into one edible dish. It is exactly that! Just like soups, it is the perfect way to use leftovers, ingredients that are in small supply, or quite simply, the food that will rot in a couple of days if you don’t use it. Why do you think everyone’s chicken soup is different? The fundamental difference between an omelet and a frittata is air. 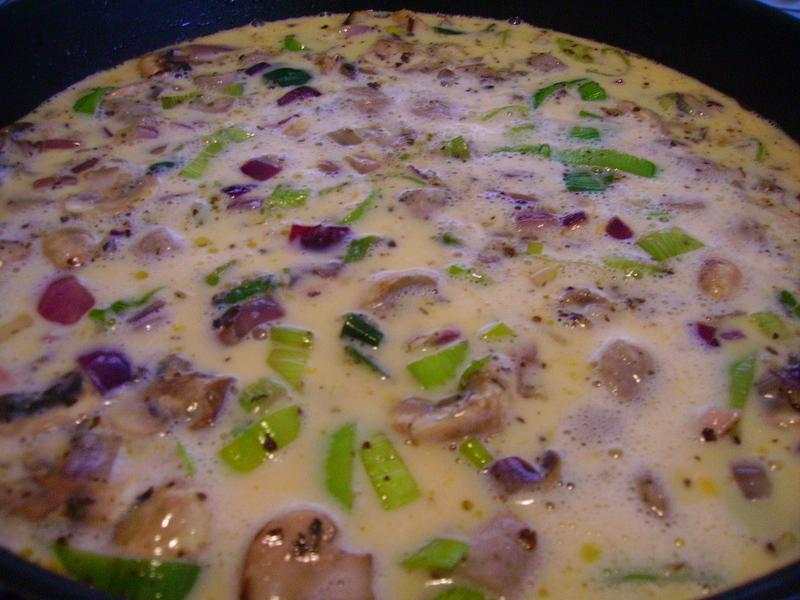 Eggs for a frittata are beaten with the addition of milk to incorporate more air into the egg so they rise when placed in the oven, while an omelet is slowly stirred, that is the basic difference in a nutshell. So after a week of cooking I certainly have a few things in the fridge that I cannot use as the main ingredient anymore cause there’s just not enough, and I have some items that if I don’t use by tomorrow I am going to have to throw away. 1 Small end cut of ham, looks like a 2×3 pyramid, not enough for a sandwich so in it goes. 1 SLice of english Bacon. I don’t even remember what I used the rest of the bacon for or why I could not use this lonely piece when I used the other bacon, but in it goes now. 4 inch piece of Leek that I only used the top part of for a recipe the other day, and now its starting to look a bit dull. 6 Leftover Button mushrooms that I could have just put in last nights sauce but did not. In you go. 3 slices of Emmenthal cheese because I ate the other three slices earlier in the week. 1/4 cup of Ricotta cheese that I had in its original container. 1 Tbl Minced garlic, need to buy more tomorrow. 1 -2 Tbl Minced basil, getting a bit dark, but still aromatic. I got rid of 6 containers in the fridge with items that were clearly not using the capacity of their container anymore. Perfect! Now lets put these leftovers and lonely orphans into something special. Pre-heat your oven to 350 degrees Farenheit or 177 degrees celsius. Place your butter into the pan and melt on medium high heat. 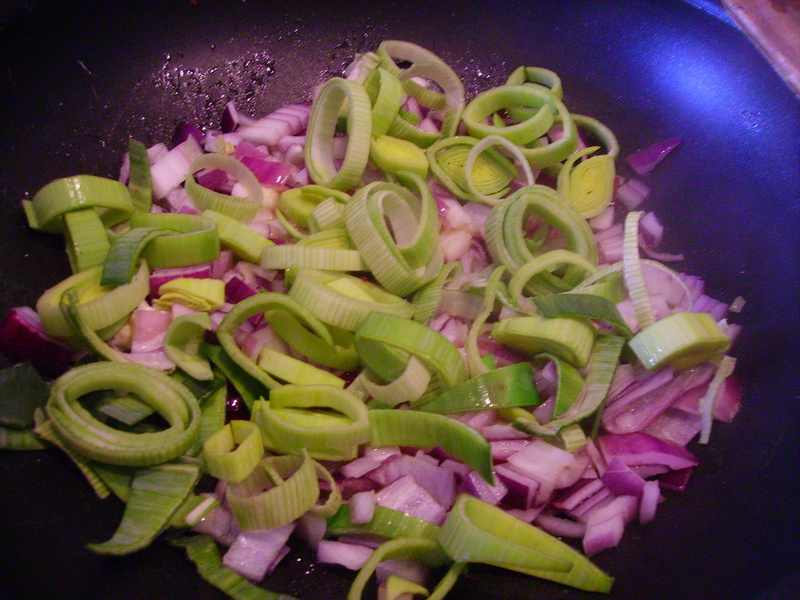 Then add your diced red onion and leeks sliced into mini rings. 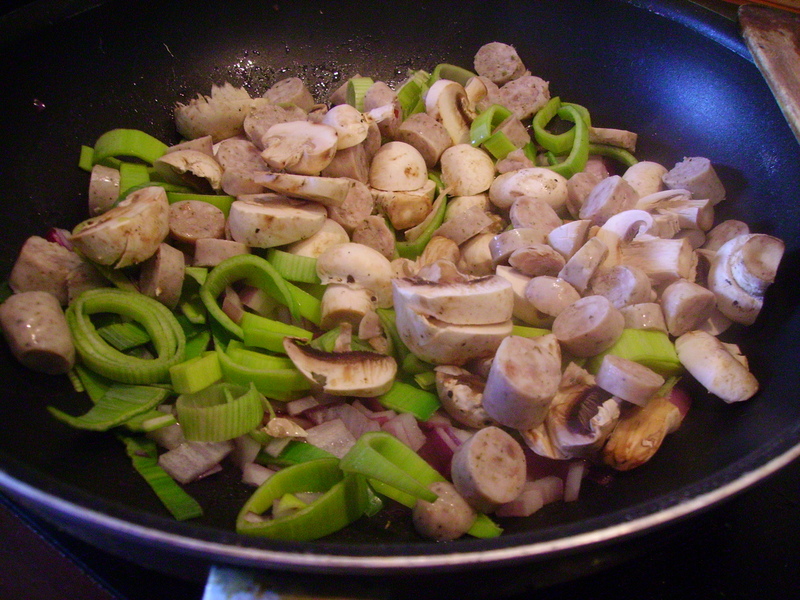 Next take your diced ham, sliced sausage link, and that lonely slice of diced bacon and add it to the pan along with your mushrooms, basil and garlic. Stir to incorporate. Just cook for 2-3 minutes and then add the ingredients to a baking pan 2-3 inches deep. Then pour your beaten eggs and milk to the pan. I used an electric mixer to really beat the eggs and incorporate air into them. Then add your chopped spinach and push down lightly so that the egg mix slightly covers them but not all the way. 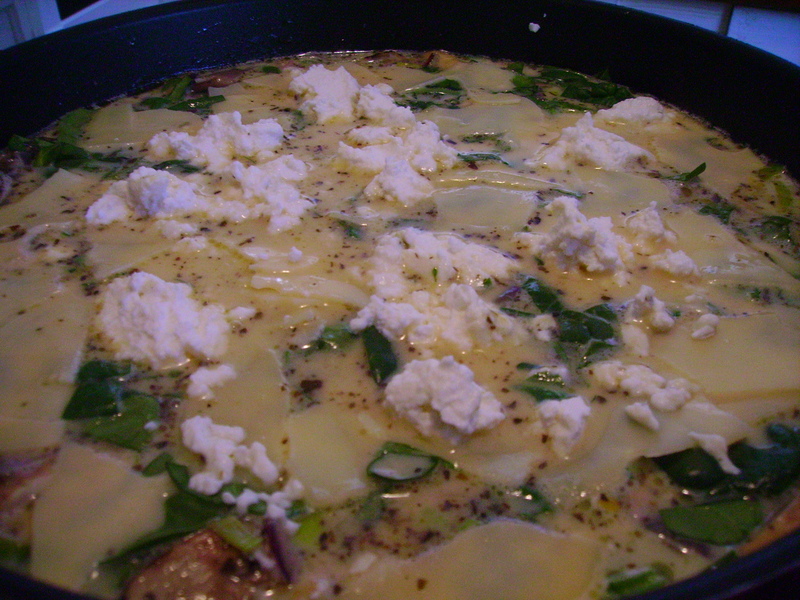 Then add your sliced chee se and ricotta on top of that. I also slightly pushed down on the sliced cheese. Place in oven and let cook for 30 minutes. Remove from oven and let stand for a few minutes and then serve. Not quite Quiche and not quite an omelete, this light and tasty dish with leftovers from the fridge can only be one thing….a Frittata. 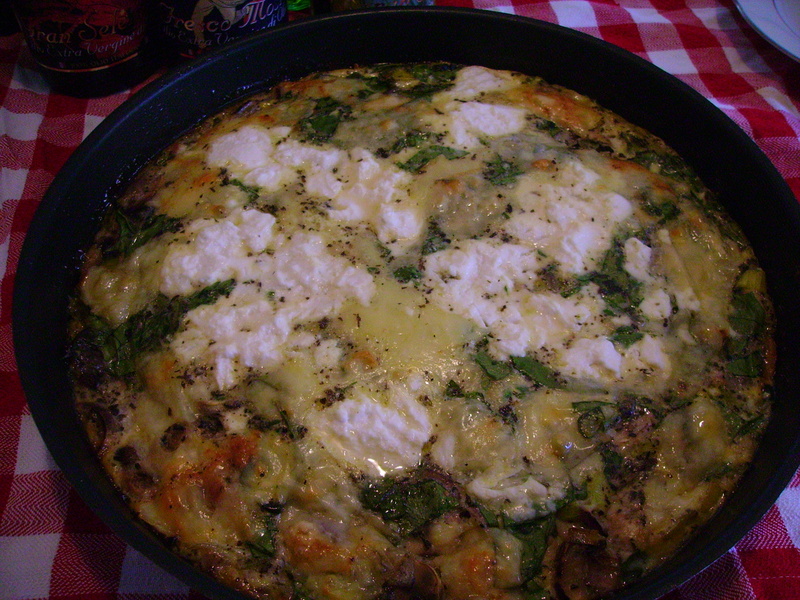 This entry was posted in Appetizers & Snacks, Baby Spinach, Basil, Breakfast, Breakfast-Links, Butter, Button Mushrooms, Cheese, Eggs, Ementhaler Cheese, English Bacon, Food, Frittata, Garlic, Ham, Herbs & Spices, Leeks, Mushrooms, Onions, Recipes, Red Onions, Ricotta Cheese, Vegetables. Bookmark the permalink. For future reference, the name of the temperature scale used in your recipes is spelled “Fahrenheit.” I mention this only because you use the word frequently. It looks great! I will enjoy it this weekend. 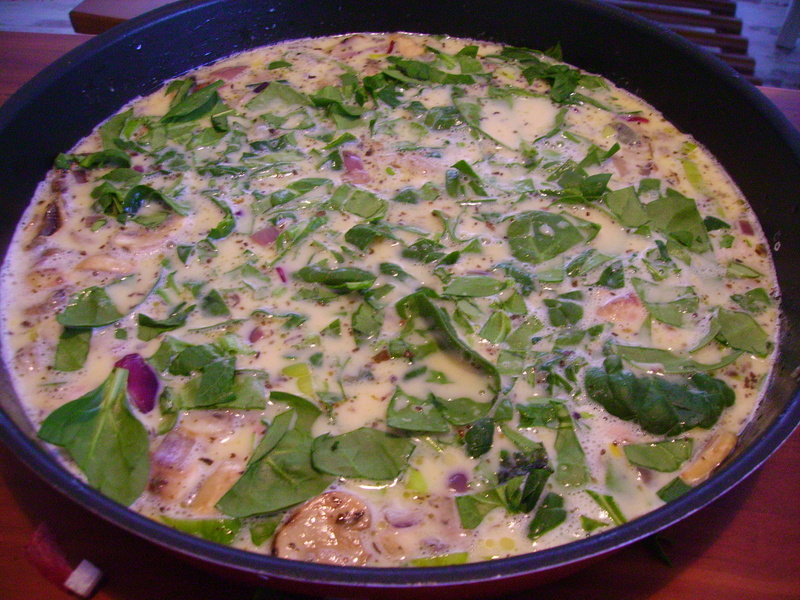 Frittata is so wonderfully versatile, you really can use it as a clean out the fridge type meal. Yours looks delicious! Thanks for stopping by. Glad you thought it looked delicious. I would be a liar if I said it was not delicious 🙂 You are certainly right about it being perfect to clean out the fridge. Nothing goes to waste. Great when you have a little of this and a little of that that can be combined. Oh Boy! That looks wonderful. I will add it to my list for sure. I find that when I pull together the kitchen sink items at the end of the week, the result is often dynamite! Thanks for commenting on my blog, I’ll be back. Your frittata looks great! I could really go for some of that right now–it’s still kind of breakfast time, right? 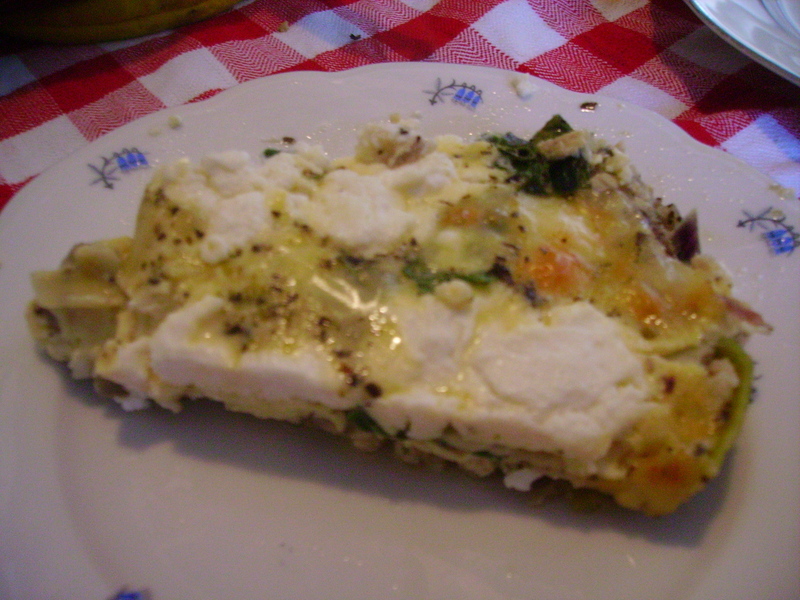 =) And I love the idea of using the frittata as a catch-all for leftovers. Thanks for stopping by. Anytime is breakfast time 🙂 It is definately a way to dress up any leftovers into a whole other meal you could even serve to guests, or those friends that stayed over night.